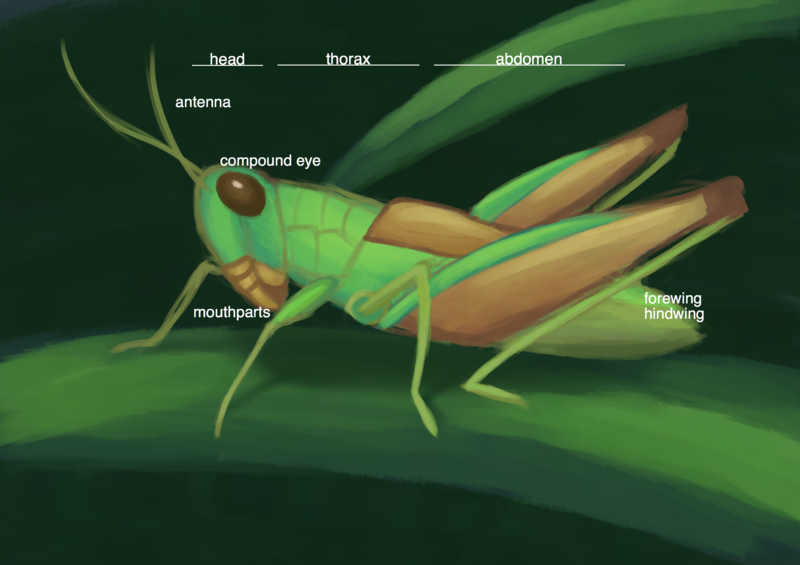 I have chosen the bugs with alien heads as my study organism for this vision neuroscience project, and so the first step is to seek out existing knowledge and familiarize myself with the grasshopper’s morphology and neuroanatomy. Grasshoppers belong to the kingdom Animalia, phylum Arthopoda, class Insecta– the largest and most biodiverse group of animals on Earth– and order Orthoptera. Their bodies are characteristically segmented, divided into three regions– the head, thorax, and abdomen. A pair of antenna on their head, for chemically sensing the world. Two dark, brown eyes (and microscopic “simple eyes” between the main eyes) Their mouthparts are adapted for chewing plants in the field or the garden (they are the “bad bugs” to gardeners). (Fun fact: They vomit a putrid and slightly toxic brown bile when they are in danger. It’s another escape mechanism, a way to say to the predator “I throw up. Don’t eat me.”) Their thorax is the center two pairs of wings (forewings and hindwings) and for three pairs of legs– the first two pairs for walking and the last big pair for jumping. Now, let’s peek into the grasshopper’s nervous system, the focus of my research project. Differently from animals like jellyfish with “loose neural nets” and no central “brain,” there are animals with “bilateral symmetry” have neural architectures that include bundled groups of neurons we call the “brain” or “ganglia.” Intuitively, your cousin running cross country and a grasshopper hopping from a hungry bird look nothing alike. But guess what– as evolution on Earth played out thus far, both humans and insects share the bilateral symmetry feature. Both bodies contain nerves (bundles of neurons) contained in ganglia or brain that control behaviors ranging from visual sensation to limb movement. The exquisite complexity of insect’s behaviors and their relatively tiny and “simple” brains make them fascinating study organisms that have been contributing to the scientific understanding of the fundamentals of neurons and neural networks ubiquitous across species. The insect nervous system consists of bulbous bundles of neurons called ganglia. The ganglia are connected by nerve cords and run through the body segments of the animal, from head to tail. This is a computer network of up to 1 million neurons (compared to the 1 billion in humans). As mentioned in my detailed description, I focus on the grasshopper’s visual system, which underpins the animal’s detection and motor response, both of which form its see-and-jump escape mechanism. 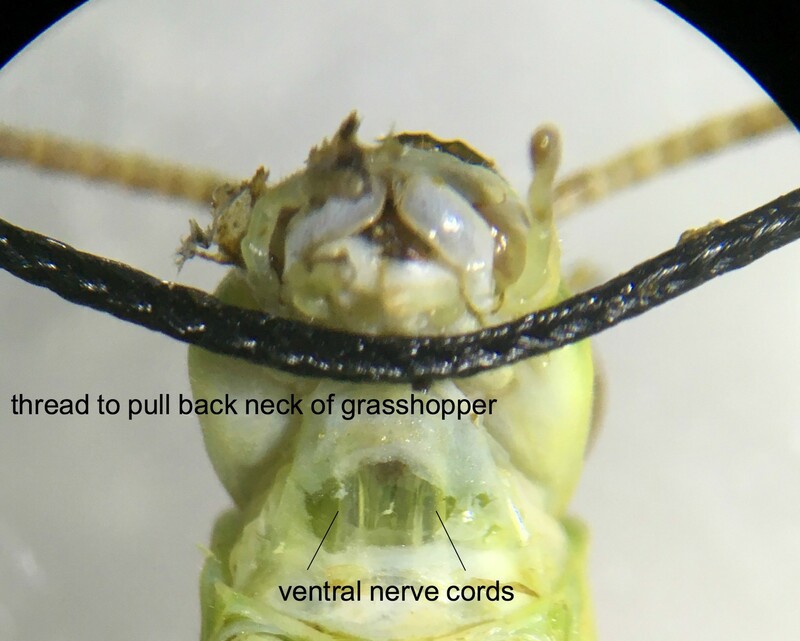 The optic lobe of the grasshopper lies in the “central brain” near the eyes and processes visual signals. This is where a type of detector neurons reside: the lobulla giant motion detectors (LGMD). 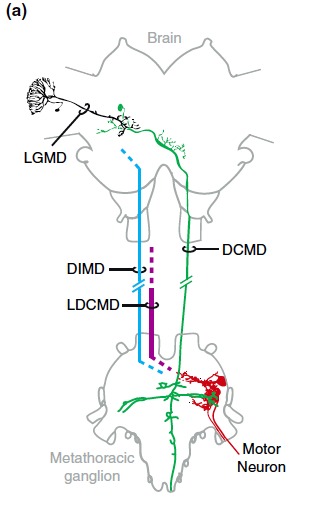 The LGMDs communicate and send the neural signals to the nearby descending contralateral motion detectors (DCMD), the neurons that run from the eyes to the legs of the grasshopper and whose activity I aim to record and analyze. To better know the location of the neurons of my study, I performed a simple surgery on a little guy to expose the neck connectives or ventral nerve cords– two translucent tubes– between the head and the ganglia in the thorax. The DCMDs receives input from the optic lobe and output here in the thoracic ganglia interconnected by the VNC. 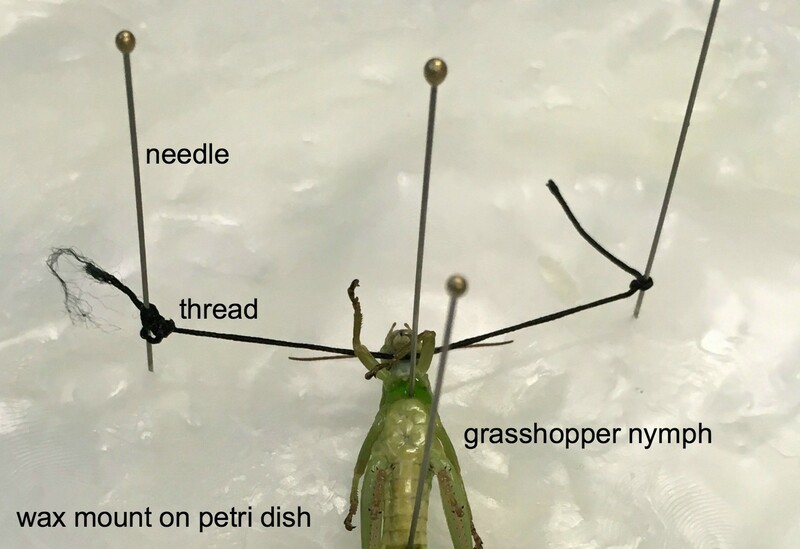 Thus, under the neck of the grasshopper is where I can make extracellular recordings of the DCMDs. Under the microscope– Ventral nerve cords spotted!